In the age of iPhone photography, most people seem to think that shooting a photo is all there is to it. Well, first you have to see the image, that is pre-visualize it as an interesting two dimensional image. Next, you have to have a camera or iPhone with you. Third, you need to compose the image and click. Then, many will share the image instantly on social media. Done. Often you will get pretty cool results with that workflow, but professionals know there is much more to image making. Much expertise goes into lens choice, camera settings for depth of field, selective focus, and then processing. My workflow includes processing first in Adobe Lightroom, then Photoshop, and sometimes even a third application such as Topaz or Nik/Google applications. The impact of this tulip image is the result of my experience with shooting choices as well as processing choices. This high contrast image of the rare green and white tulip encourages the viewer to enjoy the detail and shape of the petals. A non-photographer will often ask the question, “Is that photoshopped?” as if the question were really, “is it real?” I like to explain that processing a digital photo with image editing software like Lightroom and Photoshop is an essential part of the creative process. I MAKE an image. I don’t just TAKE and image. Using Photoshop to process images is, in fact, my job. The cool thing about a 15mm lens is that you can elevate your foreground subject to become the center of the universe. As the background blurs in the distance and rounds itself to represent the whole world, this single tulip in its brilliant pink hue and crisp focus dominates the scene, or if you will, the whole world. Acres of tulips in bloom? 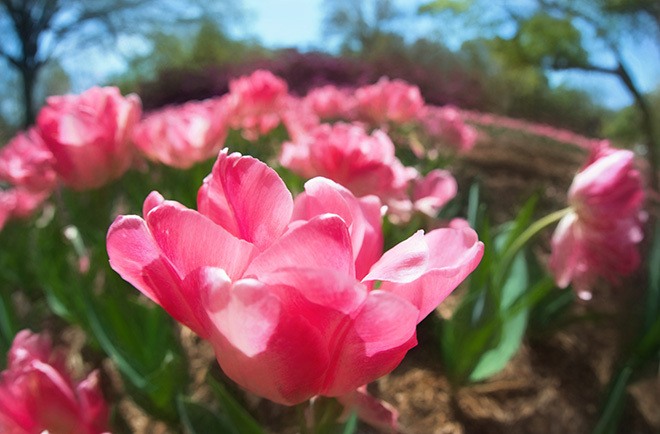 Try using a 15mm lens and showcase a single tulip. This is one way to photograph hundreds of colorful tulips in bloom in Baltimore’s Sherwood Gardens. Scanning acres of tulips and azaleas, I found that one place to begin was on my knees with one tulip, just one.